Creating and managing your events with Guestsnow is the best way to ditch the clipboard and check-in your eager guests. But we can’t forget that Facebook is still an important hub for tracking your social calendar and events. Thankfully, you don’t have to choose. In the first Facebook Events integration of its kind, Guestsnow can seamlessly connect your Facebook Event with your Guestsnow account so you can tap into all those social followers and enjoy the full slate of event management features Guestsnow has to offer. Now, there’s no reason to limit yourself. You can get the best of both Guestsnow and Facebook without cramping your style and knowing no other event management platform can currently do the same. Try Guestsnow for free or log into your existing account to explore this exclusive and valuable integration for your next event. Levi’s invented the blue jean in 1873. Almost 150 years later, they’re still the coolest legwear for men and women and the brand remains a fashion staple around the world. When they came to Guestsnow looking for help to manage their last event, we were excited to provide the customization features they needed to continue to stand out from the competition. 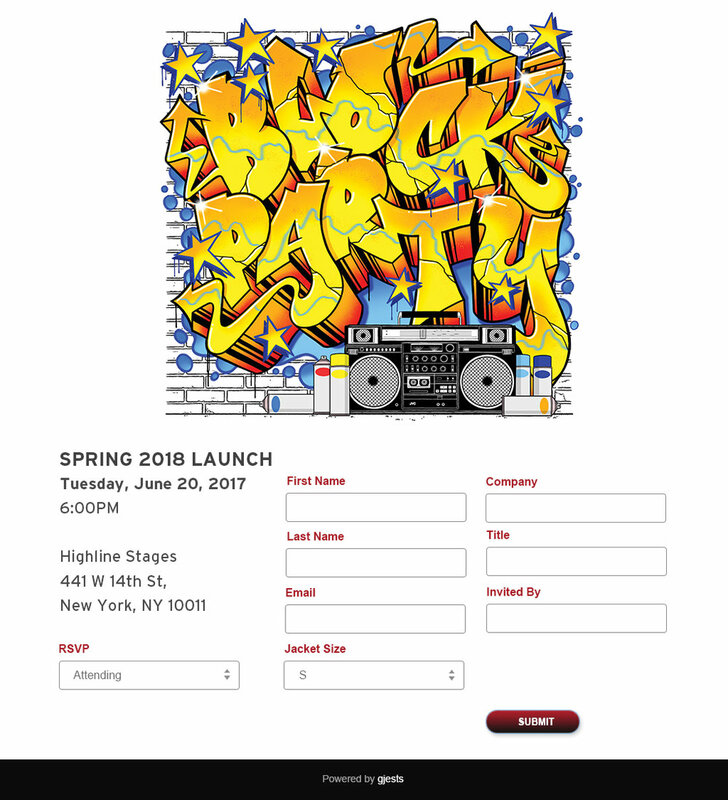 To do this, Guestsnow implemented a custom design for Levi’s event RSVP landing page. We included a range of relevant questions like “What is your jacket size;” “What company do you work for” and “What is your title;” and of course, the standard “Are you attending the event” and “Who invited you.” This not only fulfilled Levi’s branding and customization requirements, it also allowed them to capture the exact data they needed for remarketing, production, and customer service needs. Furthermore, by using Guestsnow instead of hiring a contractor to build a new webpage and manage it, Levi’s saved a lot of time and money they can now repurpose in other ways. All of Guestsnow’s packages include our full suite of features and allow you to select the right one for your needs, whether it’s paying one flat fee for a single event or a monthly subscription if you’re an event-planning machine. Try it now for free or log into your existing Guestsnow account to play with our customization features. These are guaranteed to help improve your branding, guest experience and data surrounding all your events. Upload the perfect custom wallpaper to your RSVP event landing page at no extra cost. Have walk-up guests? No sweat. Add and check them in at the same time in our mobile app. Time: saved. Check-ins are great, but sometimes you also need to know when people check-out. Our new feature does just that and it's perfect for keeping track of numbers at a seminar, camp, or high-security event. Did you know that you can upload GIFs to your invites and RSVP event landing pages to make them stand out? Event Sign-In has never looked so good. We added an extra column for affiliation when you upload your Excel or CSV guest lists. Your guests' affiliation now appears under their name on the check-in screen in our app. You can now easily import both email and guest name with our text box upload to your guest list. Simply type 'Guest Name, Email Address' and click the Add button to update your list. Try and sign up with Guestsnow for free! Start saving now and never compromise on your features! When planning events, you’re juggling a million things: venue, activities, budgets and of course, RSVPs. If you’re on top of your game, you will have sent your invitations far in advance, to make sure your guests pencil in that date and attend the festivities. But what happens after? We all know things change, people forget, and once the event is over, it’s onto the next big thing. Here’s how to stay top of mind without overcrowding your guests. Most likely, some elements of your event will change as planning progresses. You probably don’t need to email your guests with every little update, but things like a new start time, change of venue or modification of a theme are quite important. Keep all of these relevant tidbits together and share them as a joint update/reminder close to your event date, or contact your guests right before for last minute updates. Guestsnow has a new feature that does just that. Type out the body of your email with your updates, select the list you wish to send it to and voilà. With emails and invitations coming in left and right, it can be hard for guests to know which events actually need their attention. That’s all very well for the spontaneous dude and dudette that go wherever their hearts takes them, but with your budgets, estimates and plain sanity, an RSVP is key. Enter: the reminder email. A gentle prod in your guests’ inbox with a targeted message can go a long way. Use Guestsnow’s RSVP Email Reminder to let guests know your awesome event is around the corner, and if they want to take part, here’s where they can RSVP. A check-in doesn’t just have to be when your guest arrives at the party and passes the checkpoint. Stay connected with the people who attended and follow up with a post-event email. You can link to some cool pictures, use Guestsnow’s analytics to post interesting stats or simply say hi and thank you. Lucky for you, Guestsnow has just launched a Follow-Up Email feature, too. So tie up all your event loose ends with Guestsnow and its latest features, available for one flat fee along with all its other cutting-edge options. Sign into your Guestsnow account or try it out now for free. We're excited to share the launch of Guestsnow's upgraded RSVP system. Our robust new features, from custom subject lines to personalized RSVP links, will ensure your event registration is more professional and easier to manage than ever. Check them out below. Hosting a private event? Lose the party crashers and use gjests to manage your invitatins. Simply upload your select guest list and our system will allow only those included to RSVP to your event. RSVPs slowing down? Take control and confirm your guests manually by moving them from Pending to RSVP'd. Alternatively, send guests who have yet to confirm a friendly reminder.